Aunt Glo can't tell which slide she's choosing. She just feels for them in their blue plastic box, and it's like a surprise. When she puts the slide beneath the stage clips, then we can see what she's picked. A plant leaf looks like a stone wall along the edges. "Ain't that something," she says. "You'd never know from just looking at it." But everything's transparent if you slice it thin enough. You'd never know from just looking that there's anything good about Kendra (Kenny) Lugo's life. Her mom has died young of breast cancer; her dad is in prison, and she lives with his girlfriend, "Aunt Glo," her sons, Quinton, twelve, and Tim-Tim, nineteen, and granddaughter, Daphne, whose addicted HIV-positive mother shows up unwelcome and infrequently. Kenny has earlier been sexually abused by Tim, and this trauma, compounded by her mother's cancer, has compelled her to chop off her hair in a boyish cut, bind up her breasts, and dress in baggy unisex clothing as if denying her her gender will protect her from further pain. Although life with the painkiller-addicted Aunt Glo is far from perfect, Kenny cares deeply for her and the seven-year-old Daphne, and fears that she will lose even this imperfect family when she turns eighteen and is ineligible for state child support. And to top off her miseries, a young college student, mistakenly thinking she is entering a vacation rental cottage, is accidentally shot by their alcoholic neighbor Jarvis, a bumbling but threatening old codger who sometimes tries to lure Kenny and Daphne inside his disordered house. Kenny becomes constantly obsessed by thoughts of the murdered girl, who becomes a metaphor for her own chaotic misfortunes. But despite her conflicted self-image, Kenny has strengths which eventually promise hope for her future. Avoiding the high school cafeteria scene, she spends her lunch period hanging around the yearbook office, where a perceptive teacher finds small jobs to provide cover for Kenny and eventually allows her to use the staff camera to make photographs for the annual. In learning to compose her shots, Kenny somehow finds a measure of control which seems lacking in her real life. Behind the camera, Kenny finds a place for herself, and as she does, her future opens up to her. "What's going to happen when I turn eighteen?" I blurt out too loud, and then I'm wailing. It's embarrassing how loud I am. I hear it but I can't shut up. "Nothing special, I don't reckon," Aunt Glo says. I stammer, "But where will I go?" Still too loud. I can't look at her. Aunt Glo says, "Nowhere, baby, unless you want to.... You're my girl." "No," I say. "Daphne's your girl." "Oh, quit feeling sorry for yourself," Aunt Glo says. "It ain't your place to put limits on my love. I've had you near as long as I've had Daphne." Grace seems an unlikely quality in Kenny's life, but grace is what she finds as the people around her turn out to have more to give than she expects and her own resilience proves equal to her needs. 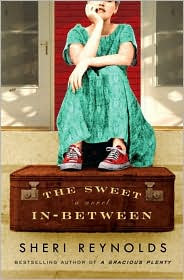 Sheri Reynolds' latest, The Sweet In-Between: A Novel is not an easy book to read at first, but despite the ugliness of her situation, Kenny finds that saving grace within herself and close to home. This is not a novel for everyone, but for the mature young adult The Sweet In-Between: A Novel, does not deny the redemptive power within the human heart. Sheri Reynolds is also the author of best-sellers The Rapture of Canaan and A Gracious Plenty: A Novel. Labels: Family Stories, Young Adult Fiction (Grades 10-Adult).